Toseland is a band fronted by (and named after) twice World Superbike Champion James Toseland. They have made quite a name for themselves over the past twelve months or so with an impressive string of festival appearances (including Download), high profile headline shows and the much sought after opening slot on Reef's 20th anniversary tour. 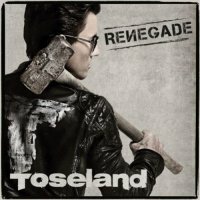 The first two Toseland singles 'Life Is Beautiful' and 'Renegade' (which top and tail this debut album) have been getting some serious attention from the mainstream media and DAB radio, and I'll wager that attention is set to intensify yet further now that 'Renegade' (the album) is primed and ready to go! Written and produced in collaboration with Little Angels front-man Toby Jepson, 'Renegade' surprised me because it has real credibility and strong musical sensibilities – nothing like the usual pile of self-indulgent dross 'misguided' celebrities foist upon a fawning public ready to sell their virginity to any passing snake oil salesman (although to be fair to Toseland, this isn't his first rodeo as he's been performing with Crash for some years). Characterised by gritty riffs, yet possessed of strong hooks and melodies, the Toseland sound is a heady mixture of Guns 'N' Roses, AC/DC, Alter Bridge, Shinedown, latter day Bon Jovi and Daughtry – kinda classic 1970s driving Hard Rock retrofitted with a modern day contemporary sheen. As well as fronting the band (his gravelly, yet warm voice is well suited to the band's chosen direction), Toseland plays piano throughout, and keeping it in the family as it were, his brother-in-law Zurab Melua (younger sibling of Toseland's wife Katie Melua) turns in a suitably impressive performance on guitar. Blessed with a good cross section of moods and tempos which enhances the overall album dynamic no end, angst fuelled tracks like 'Crash Landing', 'Burning The System' (a real AC/DC-esque foot stomper), 'Good Eye Blind' and 'State Of Emergency' rub along well with slower numbers such as the soaring ballad 'Just No Way' or the moody 'Kingdoms'. The sound is fat and powerful, the performances filled with self-belief and passion, and as I said earlier, all the songs have hooks and melodies strong enough to dig their claws in after just one or two listens. Very impressive stuff!